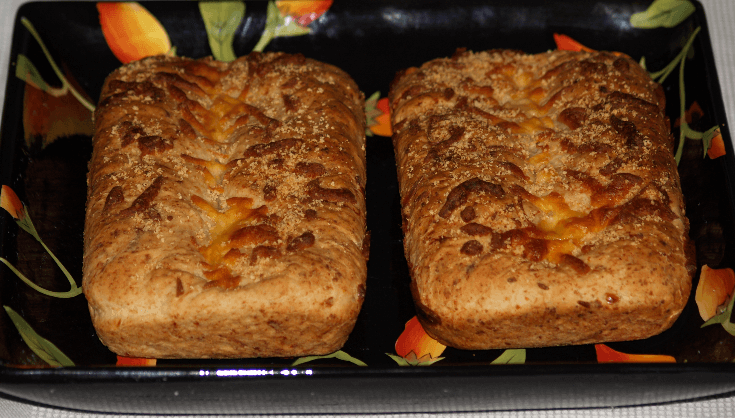 Do you know how to make cheese bread recipes? These are all very common throughout the world. These two ingredients have made the perfect and popular combination throughout the history of the world. A simple slice of cheese between two slices of bread, grilled or not, is a regular on most household menus. Here in the United States more and more restaurants are learning how to make cheese bread recipes. We are seeing when we eat out, these breads are showing up on the menus or being served to us as soon as we sit down. One bite of the delicious cheese garlic biscuits from Red Lobster had me hooked; I had to start making them at home. Since I learned how to make cheese bread recipes I found they can be made with yeast or other leavening. All types of cheeses are used in these breads. Cheddar cheese is a very common one found in loaves of cheese bread. You will also find many recipes made with mozzarella, provolone, Swiss and Parmesan. Softer cheeses like cottage and ricotta make extra delicious breads so do not hesitate any of these recipes. In Latin American, the cheese bread recipes are also very popular. Many of these are made with corn such as in the cornbread recipes. These are common breads found on the breakfast menu and also enjoyed as snacks throughout the day. We are all familiar with the great Italian cheese bread recipes. Many are laden with wonderful herbs and spices and of course delicious Italian cheeses. I could make a meal out of some of these; my favorite being focaccia with plum tomato slices added. It is almost like eating pizza but lighter. Cook onion in butter until tender; set aside. Soften yeast in water; set aside. In large bowl combine cottage cheese, sugar, onions, dill seed, salt, soda, egg and softened yeast; blend well. Add enough flour to make a stiff dough beaten well; cover and let rise until doubled about 1 ¼ hours. Stir down and turn into a well greased 9X5 inch loaf pan; let rise about 40 minutes until doubled. PREHEAT OVEN TO 350F degrees; bake 50 to 55 minutes. Cover with foil last 15 minutes; brush with butter and sprinkle with salt. Combine and mix cornmeal, baking soda, salt, corn, milk, melted butter and eggs. Pour half of batter into a greased 9 inch square baking pan. Sprinkle top with chili peppers and half of cheese. Pour in remaining batter and top with remaining cheese. Bake for 45 minutes; cool before cutting. Here in the United States, we make all kind of biscuits so it is a “natural” to add cheese to biscuits. The following bake ahead cheese biscuit recipe is a great idea for cheese breakfast recipes or serve on a brunch menu. This cheese biscuit recipe can be made and stored in a plastic bag until time to serve; slice, butter and toast on griddle when ready to serve. Also store very nicely in freezer for a week or longer. Combine flour, baking powder and salt; cut in butter until consistency of corn meal. Add cheese and mix lightly; stir in milk. 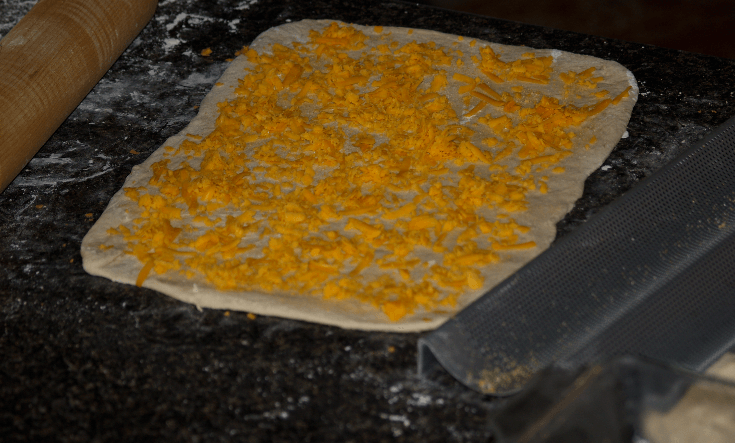 Turn dough onto a floured board; roll into ½ inch thickness. Cut in rounds with a biscuit cutter and place on a lightly greased baking sheet. Bake until lightly browned (12 to 15 minutes); after baking brush with melted butter. Onions always give a good flavor to cheese bread recipes, biscuits or rolls; great addition with the cheese. Cook onions in shortening until tender and golden brown. Combine egg and milk; add to biscuit mix and stir until dry ingredients are moist. Blend in onion and half of the cheese. Spread dough in a greased 8 inch round baking dish. Sprinkle remaining half of cheese on top, sprinkle on poppy seeds and then drizzle melted butter over top. Bake for 25 to 30 minutes; serve hot. Italy uses a lot of olives, Mozzarella cheese and garlic together. 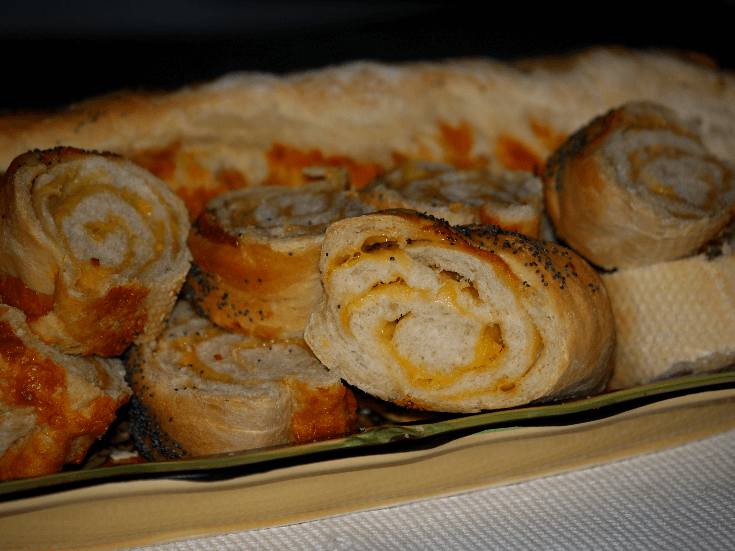 This is one of the cheese bread recipes that is so easy to make and very delicious. Guests will think you spent a lot of time preparing it! This is also good with a few thinly sliced plum tomatoes on top before baking. Cut bread in half lengthwise and place on lightly greased baking sheet. Combine and mix butter and mayonnaise; blend in cheese, olives, garlic powder and onion powder. Spread mixture on cut sides of bread; bake 10 to 15 minutes or until cheese is melted. Add cornmeal mixes to melted butter; beat in eggs. Blend in cottage cheese, broccoli and onion; mix well. Pour into greased baking pan; bake for 35 to 40 minutes. This Bisquick biscuit recipe is quick and easy and very tasty cheese bread recipe! Combine and mix Bisquick, milk and cheese until a soft dough forms; beat for 30 seconds. Drop dough by spoonfuls onto ungreased baking sheet; bake 8 to 10 minutes or until golden brown. Mix together butter and garlic powder; brush over hot biscuits before removing from tray. Combine sugar, salt, yeast and 1 ¾ cups of flour in large mixing bowl. Gradually add liquids to the dry ingredients while beating on medium speed of mixer for 2 minutes. Add cheese, egg and enough remaining flour to make a thick batter; blend well. By hand gradually stir in enough of the remaining flour to make a stiff batter. NOTE: Mixture will pull away from the side of the bowl. Cover bowl loosely with a light towel; let rise until double in bulk about 1 hour. Stir batter down beating vigorously about 30 seconds; turn into 2 greased loaf pans. Combine egg white with dash of water; brush over each loaf. Sprinkle generously with sesame seeds; bake 40 to 50 minutes until loaves sound hollow when tapped. Combine in a large bowl 1 cup flour, sugar, salt and yeast; set aside. Combine and mix the oregano, garlic powder, cheese, mint, basil, onion and sesame seeds; set aside. In a saucepan heat milk, water and shortening until warm (About 115F degrees). Add milk mixture and egg to the flour mixture; beat until smooth; stir cheese and herb mixture into dough. Gradually stir in more of the flour until you have a stiff dough; blend well. Turn dough into a greased loaf pan; cover lightly and let rise until doubled in bulk about 1 hour. PRHEAT OVEN TO 350F degrees; bake about 40 minutes until golden brown. What is Kefalotryl cheese? This is a very hard, salty Greek cheese. It is made with sheep or goat milk or a combination and has a strong flavor. It can be substituted in recipes with Parmesan or Romano. 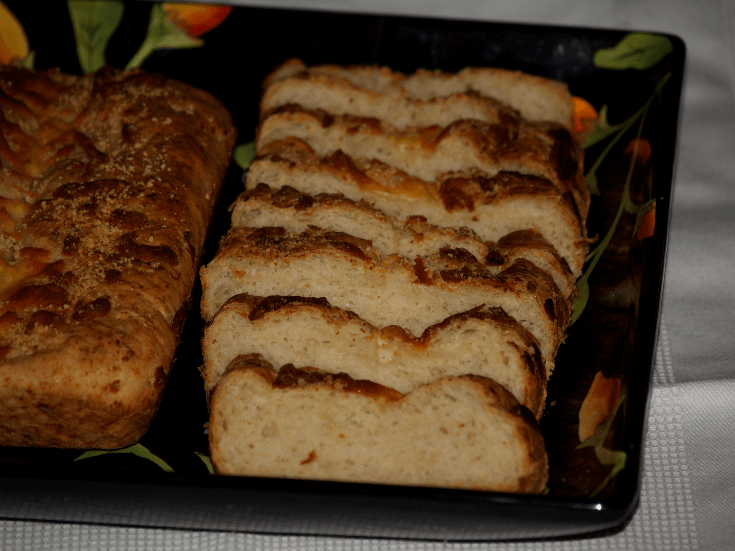 Learn how to make cheese bread recipes in long French loaves. Combine yeast and warm water; let stand 5 minutes. In a large bowl combine sugar, salt and 1 cup flour. Beat yeast mixture and oil into the flour mixture; stir in enough flour to make a stiff dough. Turn out onto a lightly floured surface; knead until smooth and elastic. Place dough in a greased bowl; cover and let rise until doubled about 1 hour. NOTE: Punch dough down 5 times during rising at 10 minutes intervals. 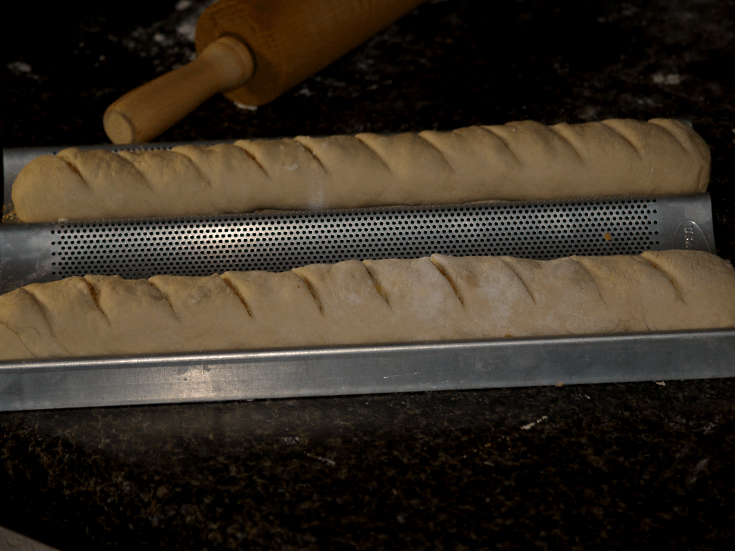 Divide dough in half; roll each into a rectangle. Sprinkle each with garlic powder, onion salt and cheese. From the long side roll up firmly into a long roll; Place on a greased baking pan. Let rise in warm place until double in bulk. Slash tops slantwise with a sharp knife. Brush tops with egg white and sprinkle with poppy seeds. Bake 30 to 35 minutes or until loaves sound hollow when tapped; 2 loaves. Learn how to make cheese bread recipes with Swiss cheese. Combine milk, sugar and salt in a saucepan and scald; cool to about 112F to 115F degrees. In a large mixing bowl dissolve yeast in warm water; combine with warm milk mixture. Beat in 2 cups of flour and cheese; stir in enough flour to make a stiff dough. Turn out onto lightly floured surface; knead until smooth and elastic about 8-10 minutes. Cover and let rise in warm place until double (30 to 60 minutes). Bake about 50 minutes; remove from pans and cool on racks. Combine in a large bowl 2 cups of the flour, sugar, salt and yeast; mix well. Gradually add water and 2 tablespoons of the margarine; mix until soft dough forms. Combine Swiss and Parmesan cheeses; RESERVE ¼ cup and set aside. Add remaining cheeses, egg and 1 cup of the flour to the dough; mix well. Turn dough out onto floured surface; knead 8 to 10 minutes until smooth and elastic. NOTE: Knead in remaining flour if needed. Place dough in a greased bowl turning to coat; cover and let set in warm place 20 minutes. On lightly floured surface knead a few times; divide into 2 equal parts; cover and let rise 15 minutes. Roll each part to a rectangle (9X15); roll up from short end jelly roll style. Pinch ends of roll to seal and place seam side down in 2 greased (9X5 ½ inches) pans. Cover and let rise until double in bulk about 50 minutes. 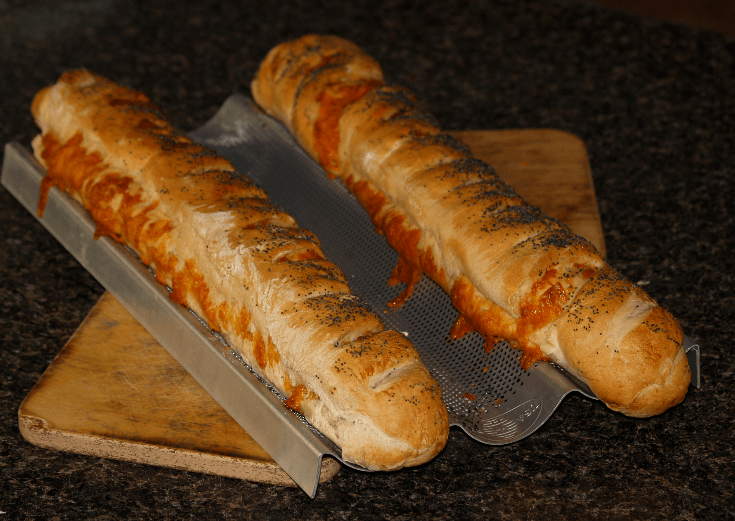 Cut a slit lengthwise along top of each loaf; sprinkle each loaf with half of reserved cheeses. Bake about 30 minutes until golden brown; immediately remove bread from pans.